The Office of Fraternity and Sorority Life and Community Involvement at UNC-Chapel Hill has selected Charlotte Parrott X’11 as an Outstanding Senior. Charlotte Parrott. Photo by Henry Gargan. For the last few years, our staff in the office has selected 2-3 seniors from each council to recognize at the Chapter Excellence Awards for their outstanding contributions to the Greek community and Carolina campus at large. There is not any hard criteria, we simply brainstorm, “who is graduating that really embodies what we hope all students can make of and get out of the Greek experience at Carolina”. 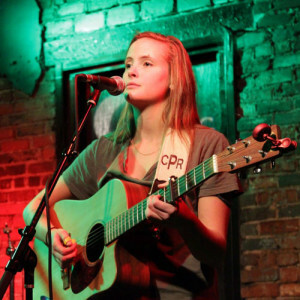 Parrott, a graduate of Myers Park High School in Charlotte, NC, is an English Literature major and a singer/songwriter who performs regularly around the Triangle. She has held several leadership positions during her time as member of the active Xi Chapter. Congratulations and snaps all around to Charlotte!